It's BamBox time! This month's theme was: "Legends". We received an email last month, that the December Box would be the last box we would receive, because of the high international shipping fees. Fortunately BamBox decided that we will receive next month's Anniversary Box, but that will be the last one. So you can expect another BamBox Unboxing next month. Let's get back to this month: of course we made an Unboxing Vlog again and you can find it at the bottom of the article. Nick Cocozza is back this month for another great set of pins. 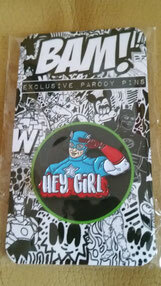 This month I got the Captain America Parody Pin (as you can see on the picture). Carola got the "Winter is Coming" Winter Soldier Parody Pin (as you can see in the video). 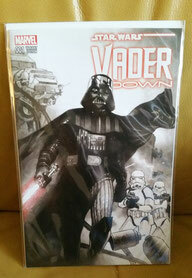 One of the two comics in this month's BamBox is this Limited Edition "Vader Down" Comic by Dynamic Forces. The artist that made it is Olivier Coipel and it's limited to 15000 copies. I got the special Black&White one, limited to only 5000 copies. The next item was the "Start your own Legend" set. It contains two swords (which are actually letter openers). Because every legend needs a way to defend him or herself, right? 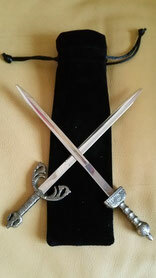 You could either get the two swords (As Carola and I got) or two knives. This month's signed Art Print is by Miami-based artist Brian Reedy. 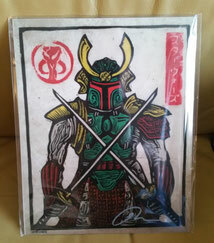 With this print he mashed space and samurai together, resulting in this very cool Boba Fett/Samurai Print. There were 4 different versions to get and all of them are numbered. The last item in this month's BamBox is this exclusive Stargirl picture signed by Sarah Grey. Sarah plays Stargirl (part of the Justice Society of America) in Season 2 of "Legends of Tomorrow". There are some rumors about a possible spin-off on the CW. What did you think of this month's BamBox? What was your favorite item? Let us know in the comments below. Next month's January Box will unfortunately be our last BamBox Unboxing. So be sure to check that one out and take a look at our other BamBox Unboxing articles (to be found in the merchandise section of the website).